Jerusalem, Israel — May 9, 2018 … Somewhere in the United States, Europe and Asia, Mr. and Mrs. John Doe are waking up. They crawl slowly out of their beds, make their way to the bathroom, then to the kitchen to boil some coffee or tea. As they sip their Starbucks or Dunkin Donuts they glance down with eyes half open at the Sunday paper. The front page has something to do with Trump, a volcano in Hawaii, North Korea then some local news about their school board and the opiate crisis. Minutes later they will reach the bottom of page 12 where a buried headline reads: “Dozens of Palestinians wounded in 6th weekly Gaza protest”. Most will read the headline, few will read the story. But that same headline, seen week after week on page 10 or page 12 or page 14 remains deep in their conscience. It’s a headline that cries out that once again Israel is brutally attacking the poor, victimized Palestinians. There is no context. There is no editorial balance. The story comes directly from the Associated Press which feeds thousands of global print, broadcast and digital media. AP reporter Fares Akram writes from Gaza City that black smoke from burning tires mixed with streaks of tear gas hover over the Palestinians, 70 of whom have been wounded by Israel fire. There is no mention of Hamas until the last paragraph and that only comes with a brief description that Hamas is an “Islamic militant group”. In reality, Israel once again is being forced to defend her civilian population on the southern border with Gaza and on her northern border with Syria and Lebanon against Iran and her US designated terror organizations Hamas and Hezbollah. But that totally escapes the reader. That reader could be a carpenter, a car salesman, health care worker, taxi driver, waitress, an officer in the Pentagon, a congressman or Senator. Bottom line, Israel is once again losing the PR war. The battle for souls and minds lost to a professional propaganda machine based in Tehran and outsourced to “peace organizations” in the UK and US. Jews from London, Paris and Rome to New York, Toronto and Melbourne are again tragically on the defensive as they attempt to speak out proudly about Israel. Many truly don’t know what to say and some are even ashamed of Israel’s basic right to defend herself. 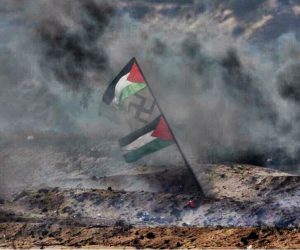 Any Jew who ventures to visit #GreatReturnMarch or #GolanHeights on Twitter will be greeted with a barrage of anti-Israel, anti-semitic comments, videos and photographs which depict suffering Palestinians. Much of the content is professionally staged. It’s called Pallywood. But Mr. and Mrs. John Doe do not know that. Yes, we have a few, strong, articulate online Jewish advocates coming from the IDF, the Prime Minister’s Office, the Israel Ministry of Foreign Affairs, the World Jewish Congress and even the Mossad – but it is not enough. It is not effective. We are heavily outnumbered on social media by fifty to one! Israel will take every action to insure that innocent civilians in the region are not harmed. Today it starts with the AP reporting from Gaza City. One cannot file an objective news story from Gaza City that is in any degree critical of the Hamas ruled government. Do that and you will get a bullet to the head. AP, which should have another correspondent reporting from the Israeli side – for editorial balance, is missing in action. Can professional Jewish advocates i.e. – HonestReporting.com, Stand With Us or the Israel Project fix this? Mostly it is Israel’s negligence not to provide professional, basic media resources in a comfortable, air conditioned, computerized environment in Jerusalem and on the Gaza and Syrian borders. All it takes are a few IDF army tents with tables, chairs, electricity, Internet and coffee. In the many years that I have worked as a journalist and or as a senior media consultant in Israel – we have always had a professional media center in operation to provide real time, 24/7 information to the global media during military operations. When public opinion has a direct impact with lives on the ground there is no debate. The Prime Minister’s Office needs to immediately coordinate a media center(s) with the Ministry of Foreign Affairs, the Israel Defense Forces and Israel Government Press Office to provide access to both the Gaza and Syrian border, photographs, news releases and spokespeople to answer questions. This is crisis communications, reputation management 101. In some minds in Jerusalem, controlling the narrative is solely defined as opening fire to defend your civilian population. With others it takes the shape of educating your fellow Jews, Western democracies, the UN and the International Criminal Court in The Hague of the defensive action Israel is taking to preserve her existence. Without this critical, real time flow of accurate information coming from our public affairs experts in Jerusalem, that AP story will slowly transcend into cancerous anti-semitism. Israelis are Jews and Jews are shooting at “innocent Palestinians”. Jews are once again creating suffering in the world. Forget that Israel was in Haiti, Nepal, Japan and on the Syrian border with field hospitals. Forget every medical, tech and humanitarian achievement Israel has created in saving thousands upon thousands of lives. Twitter and Facebook cannot and will not replace an active, government sponsored media centers with computer terminals, coffee and live interviews with articulate, professional spokespeople who speak English, French and Spanish. That the Giro D’Italia bicycle race warrants a media center in Jerusalem and thousands of Iranian paid, Hamas inspired rioters attacking our southern border does not – truly boggles the mind.